The aviation industry has made amazing progress. 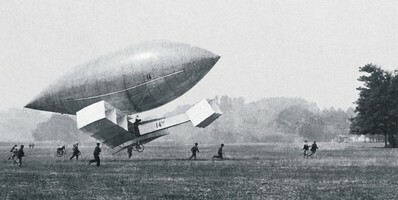 In just 111 years since the first controlled, powered, heavier-than-air flying-machine flew in North Carolina, innovators and industry have produced a spiralling succession of biplanes, monoplanes, jet aircraft, helicopters, airliners, and faster-than-sound planes. Thanks to steady advances in engineering and materials science, aviation records are repeatedly broken; aircraft are getting steadily lighter and more energy efficient. The Boeing 747 travels 20 times faster than an ocean liner, but uses less than half as much energy per passenger-kilometre; if all its seats are occupied, a 747 is as energy-efficient as a standard (33 miles-per-gallon) car with two people in it, even though the plane goes ten times as fast as the car. And the latest ATR72 turboprop is said to be 40% more energy-efficient than the 747. But if the world is serious about tackling climate change, these fantastic engineering achievements are not enough. Whereas, in the year 2000, aviation contributed 2% of global carbon dioxide emissions, it is projected that by 2050, aviation's growth will increase its carbon emissions five-fold, even allowing for continued improvements in efficiency. Moreover, today's planes emit other greenhouse gases whose effect on climate is estimated to be between two and four times greater than their carbon dioxide emissions. The Longitude Prize 2014 Flight Challenge sets a new goal for aviation: to design and demonstrate a near-zero-carbon aircraft, which travels fast (though not necessarily as fast as a jet), which has a substantial range (at least London to Edinburgh! ), and which is significantly more energy-efficient than a 747. There is no simple solution to this demanding set of constraints, but there are promising approaches that fulfill some of these requirements. NASA's 2011 Green Flight Challenge was convincingly won by a four-seat electric battery-powered aeroplane, the Pipistrel Taurus G4, which flew nearly 200 miles in less than two hours, with an energy efficiency equivalent to a 120 miles-per-gallon car. This astonishing achievement delivers all the requirements of the Longitude Prize Flight Challenge except for the range requirement — it may take significant breakthroughs in battery technology if such an aircraft is to win the Challenge. 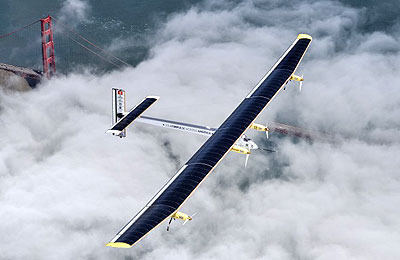 The Solar Impulse is an electric aircraft in which heavy batteries are replaced by huge solar panels spread over the wings and tail. 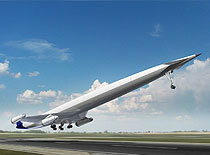 It can fly for more than 24 hours and could easily make the trip from London to Edinburgh. But with a speed of only 43 miles per hour, the Solar Impulse is too slow. Oxfordshire-based Reaction Engines have a completely different approach on their drawing board. They are designing liquid-hydrogen-burning engines that could be used to launch satellites into orbit. The same engines could also power a hypersonic passenger aeroplane, the LAPCAT, which (thanks to the very high calorific value of hydrogen) could fly from London to Brisbane in a single hop. It doesn't seem likely that the LAPCAT will be more energy-efficient than a 747, but perhaps a lower-speed hydrogen-powered approach might work. Cranfield-based Hybrid Air Vehicles are developing aircraft that are a cross between a regular plane and a blimp. 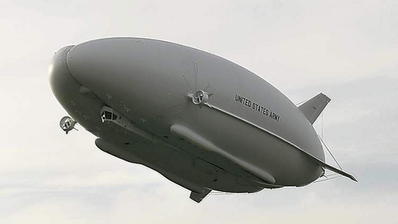 The helium-filled Airlander uses a combination of buoyancy and aerodynamics to generate lift. Their current prototype has adequate speed and range, but its fossil-fuel-powered engines emit too much carbon and use too much energy. 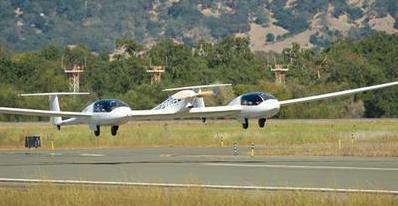 Perhaps a redesigned hybrid aircraft, optimized to work at a lower speed, might be significantly more energy efficient. We intend the Challenge to be accessible to small creative teams. Here I've described four current activities that indicate the wide range of perspectives from which the Flight Challenge might be approached. I'm confident the Flight Challenge will stimulate brilliant inventors to develop other exciting ideas for the future of aviation. Reaction Engines' LAPCAT Hydrogen plane ✔? ✘ ✔✔✔ ✔✔✔ ✔✔✔? David MacKay FRS is a member of the 2014 Longitude Committee. He is the Chief Scientific Advisor at the Department of Energy and Climate Change, and Regius Professor of Engineering at the University of Cambridge. He is well known as author of the popular science book, Sustainable Energy — without the hot air. What's the expected progress under business as usual, or if best efforts are made? The Advisory Council for Aeronautics Research in Europe (ACARE) have published their vision for 2020, in which there is a target of a 50% reduction in CO2 emissions per seat-km by 2020, relative to a base year of 2000. Of this 50%, 40% is attributed to aircraft-level improvements [in new aircraft], while 10% comes from operational improvements. From 1961 to 2000, aircraft engines have become roughly 40% more efficient [Comet 4 to B777-200], and aircraft have become 70% more efficient overall (in fuel per seat-km). However, improving an engine's fuel efficiency tends to make its NOx emissions worse. Future Aircraft Fuel Efficiencies - Final Report Gareth Horton (92 pages) Horton reckons the upper bound of likely efficiency improvements, in 2050, relative to 2000, is 71% for single-aisle aircraft. ESTIMATION OF POTENTIAL AIRCRAFT FUEL BURN REDUCTION IN CRUISE VIA SPEED AND ALTITUDE OPTIMIZATION STRATEGIES Jonathan A. Lovegren and R. John Hansman - MIT Report No. ICAT-2011-03 February 2011 focuses on the potential efficiency benefits that can be achieved by improving the cruise speed and altitude profiles operated by flights today in the USA. Their results indicate that a maximum fuel burn reduction of 3.5% is possible in cruise given complete altitude and speed optimization, which corresponds to 2.6% fuel reduction system-wide. Isn't this a solved problem? Can't we just use biofuel, especially drop-in bio-replacements for kerosene? Biofuels are often assumed to be "the answer" for aviation, and they may play an important role. There are three reasons for looking for other solutions. A biofuel-derived kerosene substitute, even if truly carbon neutral, will still cause the other [non-CO2] greenhouse-gas emissions (for example NOx), which are estimated to have at least as big a climate-change impact as the CO2 from planes. The land requirements for a biofuel solution would be substantial: if we take the IPCC's projection for global aviation's fuel demand in 2050 [equivalent to 2.5 GtCO2/y], and assume that biofuel [equivalent to 240 g/kWh] is produced with a land-productivity of 0.5 W/m2, we find the land required for biofuel production would be 2.4 million km2, which is (1/4) of the USA, 10 times the UK's area, or 100 Waleses. (1 Wales is roughly the same as 1 New Jersey.) These land requirements may be in tension with other desires for environmental sustainablity and food production. Biofuels are not necessarily "zero-carbon". Some biofuels require substantial energy for their production; and some forms of biofuel production may involve changes in carbon stocks in the landscape, compared to alternative uses of the land, such that the use of the biofuel causes substantial net carbon emissions. These land-use-change emissions may be "one-off" emissions [i.e., incurred once only], but that does mean they can be neglected. How can electric or hydrogen planes be counted as zero-carbon? Where does the electricity or hydrogen come from? Yes, "decarbonizing" by switching to electricity makes sense only if there is a proportional additional increase in low-carbon electricity generation. For hydrogen to be considered zero-carbon, it would eventually have to be produced from zero-carbon electricity by electrolysis, or at a carbon-capture-and-storage facility. What if we make artificial kerosene from CO2 and a zero-carbon energy source? Yes, artifical fuel synthesis is an important technology option to develop. It avoids the land-requirements and sustainability concerns about biofuels, and instead requires substantial additional energy inputs. "Zero-carbon" artifical kerosene will still cause the other [non-CO2] greenhouse-gas emissions (for example NOx), which are estimated to have at least as big a climate-change impact as the CO2 from planes. Also, it is important to be clear whether the artifical kerosene is truly carbon neutral; it may be [especially if the CO2 is captured directly from the air], but it depends on the source of the carbon that goes into making the fuel. Consider for example a fossil-fuel power station with CO2 capture. If this CO2 is fed to a aeroplane-fuel-synthesis plant, then we cannot declare both the power station and the aeroplane "zero carbon"! The right way to think about this set-up is that it would be getting two uses out of each fossil-fuel carbon atom, before it is released as CO2 by the plane. Some fuel-synthesis proponents will suggest getting all the required CO2 from biological sources instead - for example by capture from the chimney of a sustainable-biomass-powered power-station. Such an arrangement can certainly be imagined at small scale, but would there be enough biomass for it to work at large scale? My "Map of the World"